My overall experience was excellent, I received a call from a staff member confirming my arrival time, as I had incorrectly had 2am instead of 2pm. The room was had been recently refurbished and it was of a high standard. 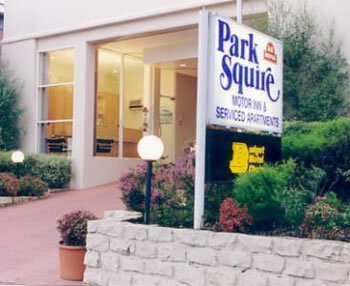 The car parking is good and overall the package is very affordable. The only downside is trying to gain access when coming from Mt Alexalder Rd. I would not hesitate to stay in the future. Dear Gary. Thanks for choosing us. A tip for your future reference. If you come from Mt Alexander Road in the peak hour, you can turn right to boundary road at the traffic light which is under the bridge and take your 1st left onto racecourse road (Where the magic car wash located). Then drive across the Flemington road then enter south gate street. That will takes you to the back of our hotel. You can then exit from church street and turn left on to Flemington Road, We are just on your left hand side. Front Gate very very hard to open before hours, has to use physical force to get it to open for the car to exit at 5am Saturday Morning, really not happy. Wooden step into bathroom not attached to the wall, with the under standing that the room is going to be updated. After hours staff member not interested in contacting the guest that had left their car lights on. Apart from the noisy road the apartment was clean and comfortable. Cost of accommodation of location to State netball centre excellent. Continental breakfast at $5 per person provide was also excellent. would stay there again. Only criticism was the smell of smoke in the room for a non smoking room but not unbearable. there was no linen on the fold out sofa bed in the living room - we told front desk about this who said it would be under the bed in a compartment. It wasn't and we had looked earlier in all hiding spots. Overall comfortable. Clean apartment apart from sofa cover which was grotty and needs replacement. Nice to have openable windows and not having to depend on air conditioning. The bathroom extractor was noisy and ineffective. The cleaning staff did a good job each day. I found the staff were very welcoming and helpful and would definitely stay again. The room was very well presented and clean. I dont think it is necessary to ask for drivers licence id then ask for a print out of my credit card. Anyone using a print out of my credit card will be charged with fraud - no exceptions. If the customer causes trouble - ring the police. They are just adding to their troubles. Your procedure gives the impression that past customers have caused trouble or that I may be a dishonest. My reaction is why are you taking in bad customers. Maybe you need to go up in the market. The best part would be car security overnight. You have the best car security of any motel Ive stayed in Melb. The unit was very comfortable and clean. It was perfect for our situation as we could cook some nights. The location was good as it right near a tram stop and train station. The staff were very kind as well. Perfect for what we wanted. Very clean and very comfortable bed. I only stayed for the one night. It was comfortable and clean and would definitely stay again. It was only a 15 minute walk to the Zoo where we were attending. It was a little noisy but was to be expected being on a main road. Over all a great stay. When booking in it was suggested that we may like to try one of the renovated rooms. Great decision as the new rooms are fantastic, plenty of lighting, great beds, big TV, and nice and light and airy. Bathrooms were excellent. Well done, will highly recommend. Our room was well-appointed and comfortable and everything worked!! It suited us very well and the room was spacious enough to be comfortable - room for yoga! We spend four nights with comfort. happy with the daily clean up. Very pleasant. Close to the city and well equipped. Everything in my apartment was clean, new and it was quiet. I thoroughly enjoyed my stay. Thank you! Only there for the night as my kids had a early appointment at the Royal Children's Hospital. Found it to be very comfortable a great price. We walked to the zoo as it was so close. Good location, friendly reception, daily room service, and relatively clean. A good stay. Good location close to city. Some rooms need updating, starting to look a little old and tired. Was attending a performance at the Melbourne Pavilion (Cnr Stubbs Rd and Racecourse Rd) so the motel was perfectly placed for my partner and I to walk to and from the venue. Home from home, I come every year in October, its great. Very happy with it, the person at the service desk was extremely helpful. Will definitely stay again in the future. Double beds too short for average adult height? My only disappointment was the noise ... I guess being an old motel it is not very sound proof. FOR STANDARD HOTEL, IT SUITED OUR NEEDS. Wonderful friendly staff, always helpful and the room was so clean and comfortable. Very convenient for access to Childrens Hospital. The overall stay was great but personally the bed was rock hard but for the money and the fact it is only a 20min walk to the Royal Childrens Hospital I cant complain. I enjoyed my stay and would be happy to come back next time. Although property is a bit outdated it has everything you need. Tram at your door for short ride into the city or to restaurants and bars in Racecourse Rd. Remember you get what you pay for . Chose this property as it was a 1/3 of the price of other properties over Grand Final and Melbourne show weekend. We found the motel convenient when coming into Melbourne early evening from Adelaide. The room was clean and a good size and the bed very comfortable. The $5.00 breakfast was great value. Overall a very pleasant stay. The only drawback was lugging the heavy suitcases up the stairs. Perfectly suitable place for business traveller. Staff very friendly and helpful.